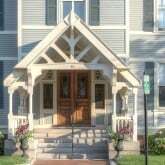 Hotels, motels, inns and B&Bs in Portsmouth, New Hampshire (NH), the New Hampshire Seacoast and Southern Maine. The region’s best lodging and accommodations. Click here for area restaurants. To change or cancel reservations made here or via "Check Rates," call 1-877-477-8591. Use promotion code HBC4933. The Hampton Inn Dover NH is just minutes from Portsmouth, nestled between the towns of Rochester, Somersworth and South Berwick. Kittery Inn and Suites is a 1950s vintage Maine motel set amongst pine trees, offering regular rooms, cabins, and suites with kitchenettes. Only 2 miles to downtown Portsmouth and Outlet shopping. Seven beautifully appointed rooms with private baths. Ten-minute walk to downtown. Complimentary hot breakfast and Wifi. Near beaches and outlet malls, the non-smoking Microtel Inn and Suites has a pretty pool and hot tub and freebies like breakfast buffets that make it one of the coastal Maine's most popular hotels. The Quality Inn Portsmouth NH offers quality accommodations at a great rate! Complimentary hot breakfast buffet, convenient to dining, movies, shopping, NH coastline and beaches, only two miles to the historic downtown area. Conveniently located 800 metres from downtown Ogunquit, this all-suite resort offers easy access to the scenic Marginal Way trail.A private balcony, free Wi-Fi and a kitchenette are found in the Sea Rose Suites. A flat-screen cable TV and a coffee maker are also included. The Water Street Inn features six thoughtfully decorated guest rooms located in Kittery, the oldest town in Maine.